There have been many horror films where the horror genre that have gone to the class room. “Tragedy Girls” is no different from those films. What drew me to this film was the fact it stars Brianna Hildebrand who appeared in last year’s “Daredevil” and featured appearances from Josh Hutcherson (The Hunger Games) and Craig Robinson (This Is the End) who also produced this film as well. 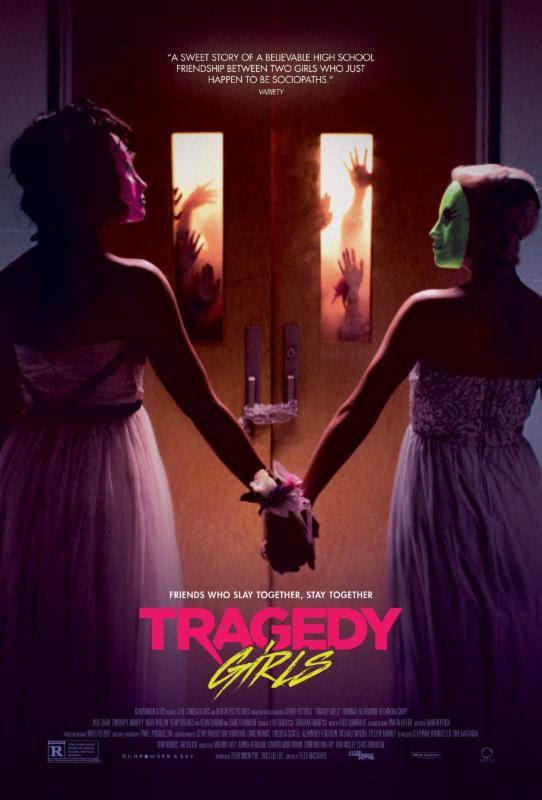 The film is about two lifelong friends (Alexandra Shipp, Brianna Hildebrand) who are always looking to find way to boost their social media page “Tragedy Girls”. Soon they come across a serial killer and take him hostage. While doing that, they also realize they need dead bodies in order to make their social media page popular. So people in their town start turning up dead and they capture that for their page. In the mist of all of this, they start to grow apart. Can their friendship survive or will they be caught or worse murdered by the killer they have hostage. It’s been a while since I’ve seen a film where I’ve had a couple of good laughs while also being horrified with the film’s action and messages. “Tragedy Girls” is a film that delivers with very good dark humor while making the action feel horrifying from start to finish. Director Tyler Macintyre does a very good job making sure the film has its dark and edgy tone from start to finish. From the way that he directs the action to how the film looks, everything has an odd and off balance feel to it which makes everything work and keeps you interested in the story. It made some the dark humor and shocking violence come off well enough that it generates some sort of reaction. Macintytre also does a very good job with the way that he handles his cast. He makes sure he gets what he needs in the performances to pull this off considering that he’s trying balance the dark humor and the gory action on screen. It kept my interested throughout. Speaking of the performances, I thought both Alexandra Shipp and Brianna Hildebrand were very good here. They do a great job carrying this film considering this is mix mash of comedy and horror. What made their performances work so well was they had chemistry with each other. It made the whole mean girls aspects work so well in the way that they handle their characters throughout. The screenplay written by Macintyre and Chris Lee Hill that is based on Justin Olson’s original screenplay was very good. One of the things that I liked about the screenplay was the fact it does a very good job balancing the film’s dark humor with the slasher like aspects. It’s something that can be tough to do but the writers pull off very well. The other thing that the screenplay does very well is to make sure the action feel horrific. It helps slows down the humor so that you become horrified of what the main characters are doing. These characters are not likable characters but the writers makes sure the material is interesting enough that it makes you’re interested in what going on in the story. It’s done in an effective way that it leaves shocked at what you’ve seen. This is one of the better twisted horror comedies that I’ve seen in a while as this felt like “Mean Girls” meet insert slasher film that you can think of. With its gory action and very good performances, “Tragedy Girls” is horrifically entertaining. “Tragedy Girls” is currently playing in LA and NY.